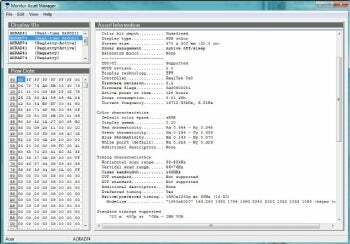 Monitor Asset Manager (free for home use) ferrets out the data that your monitor reports to Windows about its capabilities, such as supported resolutions and model number. It doesn't allow for directly changing any display settings, but can be a useful reference tool. Dig into the technical data reported by your monitor with Monitor Asset Manager. The utility lists all the available plug-and-play monitor information, including data from currently attached displays, along with Windows registry listings for current and former monitors. In Monitor Asset Manager, you'll find everything from screen size to serial number to all of the supported resolution and refresh rate combinations. While some of the technical data might be of use only to hardware engineers, other bits could help to ensure you've chosen optimal display settings. For example, if you ever forget the native resolution of your LCD monitor --which you'd want to use when choosing a Windows display resolution--Monitor Asset Manager reports it on the "Native/preferred timing" line. Monitor Asset Manager is free for personal use, but must be licensed for use in commercial environments. Licenses start at $1 per user.